The first season of BBC's Generation Y friendly Merlin reboot did an entertaining job of introducing the Arthurian inspired players and acquainting us with the rules of the game of Camelot as presided over by King Uther (Buffy the Vampire Slayer 's Anthony Head) where -- and in essence just like a lethal version of Old Maid or Hot Potato -- those found in possession of magical powers lose their life. 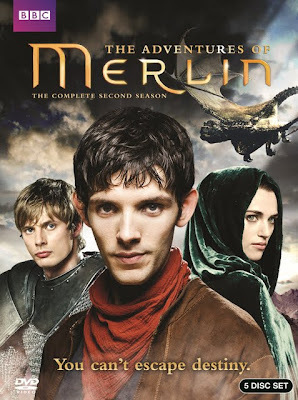 And while the ultimately charming series' adherence to predictably formulaic yet altogether benignly satisfying plotlines did begin to grow repetitive near the end of the show's initial thirteen episode run, which undoubtedly accounted for the big drop-off in viewers as Merlin continued, the game changed for the better when a new strategy was unveiled at the start of the second season. In season two, the writers rely far less on the guest-star of the week approach wherein Merlin (Colin Morgan) inevitably grows suspicious of a new arrival to the kingdom just before spells or romantic enchantments go awry and he has to thwart a plan, unmask a villain or save the day without letting anyone realize he's a budding wizard on par with Harry Potter . And although the anachronistic and often unconvincingly jokey dialogue will still send historians and literary experts reeling, as I argued in the first review, any exposure to the legend is welcome in encouraging another generation to seek out the stories of Camelot. Fittingly, since more time has gone by since Merlin first met Arthur (Bradley James), the cast's chemistry and male camaraderie seems genuine, even if at times you wonder just as you did in pondering whether Zack and Co. were the only students in Saved by the Bell , if it's probable that all characters would be both always present and able to have as much of an impact on the King's decisions. Yet to their credit, the writers concentrate on developing the core characters to foreshadow eventual arcs in their relationships with one another as Prince Arthur struggles to acknowledge his deepening attraction to Guinevere (Angel Coulby), the maid servant of his father's ward Morgana (Katie McGrath), despite the fact that Lancelot (Santiago Cabrera) eventually returns and declares his affection to “Gwen” as well. Additionally, the second season ambitiously gets the most creative mileage by hinting about the future while simultaneously revisiting the past when revelations come to light regarding the births of Arthur, Merlin and (more alarmingly!) Morgana that leave all characters questioning just what exactly this new information will mean for them in the long run. Pondering the paths they've taken and the decisions they'll make in the future, the show's brilliant marriage of the past and the future colliding in the present sets off a dangerous chain of events that pay off unexpectedly in Merlin 's daringly unexpected second half of what is ultimately the series' best season so far.